I know Christmas is over and most of you are probably no longer in Christmas baking mode, but I thought I’d share these cookies we made on Christmas Eve anyway just because they’re awesome! Snickerdoodles have always been one of my (Celine) favorite cookies. 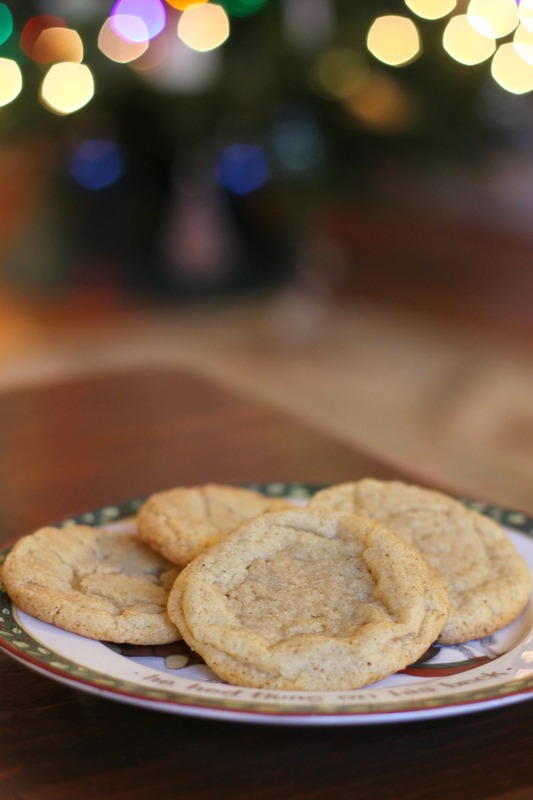 This eggnog-flavored version, which has nutmeg and rum extract to add an eggnog taste without ruining the texture by adding eggnog itself, is particularly fantastic and I know for sure I’ll be making these again! They are perfectly chewy and have just the right amount of eggnog flavor- they’re pretty addictive! These went over really well with all of our brothers. Happy Belated New Year’s- tomorrow we’ll be putting up a post with our favorite recipes of 2014! Preheat oven to 350 degrees. In a mixing bowl whisk together flour, cream of tartar, baking soda, cinnamon, nutmeg and salt and set aside. In the bowl of a stand mixer fitted with the paddle attachment, beat together butter, shortening, granulated sugar, and brown sugar until creamy. Mix in eggs and then add vanilla and rum extract. With mixer running on low speed, slowly add flour mixture and mix just until combined. Whisk together the granulated sugar, cinnamon, and nutmeg for rolling in a small bowl. Scoop dough out 1 1/2 tablespoons at a time and shape into balls. Roll dough balls in sugar mixture. Bake dough balls on a sheet lined with parchment paper (place dough balls about 2 inches apart) in preheated oven 9 – 10 minutes (the cookies should appear slightly under-baked). Cool on the baking sheet for a couple minutes and then transfer them to a wire rack to finish cooling. Store in an airtight container. Enjoy! *You can substitute butter for the shortening (which is what we did), but you should make sure to chill the dough for a couple hours if you’re making this substitution to ensure that your cookies don’t spread too much.